Encouraging infill development in the City of Yuma has been a topic of discussion among City Council and staff for the past few years, and on June 21 Council adopted the Infill Incentive Plan prepared by our department. The purpose of the plan is to explore issues associated with infill development and to identify potential incentives available to those who choose to develop and/or redevelop within the designated Incentive Overlay District. As government budgets become even tighter, the City must learn to grow within rather than expanding outward. This means accommodating growth within the existing infrastructure network, rather than expanding the City's maintenance liability ever broader. The City is conscious of the impacts of sprawling development on the environmental resources, transportation grids, and the overall quality of life for residents. The plan was written to be user-friendly; it shouldn't take an expert to understand and use the incentives being offered. 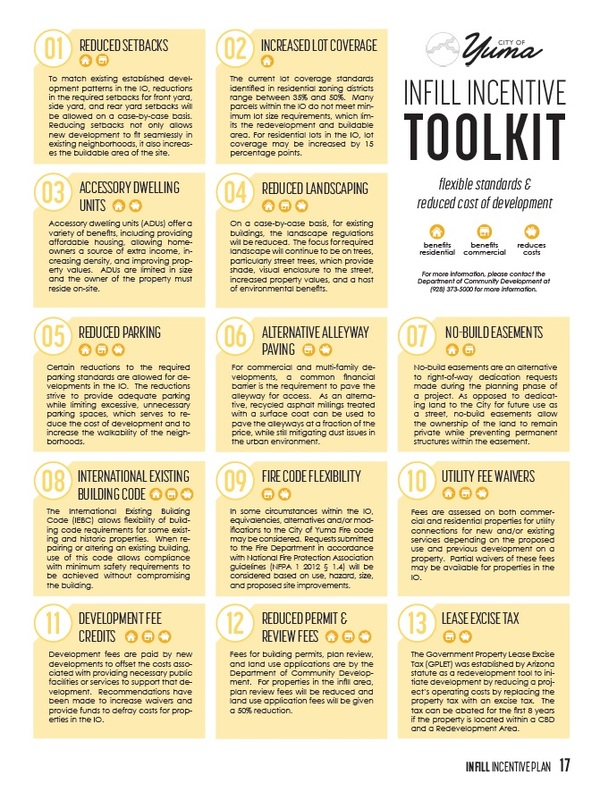 The heart of the document is the Infill Incentive Toolkit which works like a deck of cards; staff can help developers and property owners assemble their best hand for each project. Not all incentives apply to every project, but staff can help determine the ones that apply and provide the best deal for each unique project. A majority of the research presented in the plan is shown in easy-to-read graphics that I created using a combination of ArcMap and Adobe Illustrator. Research efforts started with a comprehensive inventory of vacant properties within the Infill Overlay District. Key facts are highlighted in charts and graphs. We took a close look at all the pre-development meetings held on these vacant properties, particularly the ones that remained vacant, to gain insight into the issues these sites typically face. Common problems included, among others, high utility connection fees, development fees, and fire sprinkler requirements. This research became the basis from which we recommended incentives that would be the most effective. Analysis of existing infrastructure within the Infill Overlay District. Interview on the local news station about the plan. Outreach efforts started in the fall of 2016, with the focus on educating the public on the importance and purpose of infill development. As part of National Community Planning Month, our team wrote an article for the local newspaper, the Yuma Sun, about infill. We also conducted a public input survey, utilizing the hashtag #InfillYuma to collect ideas for vacant buildings and lots within the target area. Following our presentation to the Planning & Zoning Commission, the local newspaper ran an article about the incentives offered by the plan; see below. To view our presentations to Council, click on over to the City TV broadcast site. The first presentation starts at minute 167:00.